Land records are valuable for family history research. They provide evidence of places where your ancestor lived and for how long, when he moved into or out of a locality, at least the given name of his wife, and sometimes a surprising amount of detailed information about him. Before 1850, 9 out of 10 adult males in America owned land. There is a countywide surname index to virtually every landowner in America since the early 1600s and it is more complete than any head-of-household census index ever compiled. This means you’re very likely to find information about your ancestors in American land records. The farther back in time you travel the smaller the communities your ancestor lived in. His neighbors were many times his family and he usually chose a spouse from those he saw in town or at church. TIP: A quitclaim deed can sometimes be more valuable to you than a will, in that the heirs of a deceased individual (especially if the deceased died intestate, meaning he left no legal will) would all be listed on such a deed as the heirs of the real property of the deceased—while, if a will was present, it may, or may not, list all of the immediate heirs of the deceased. These are the most common of all land records. 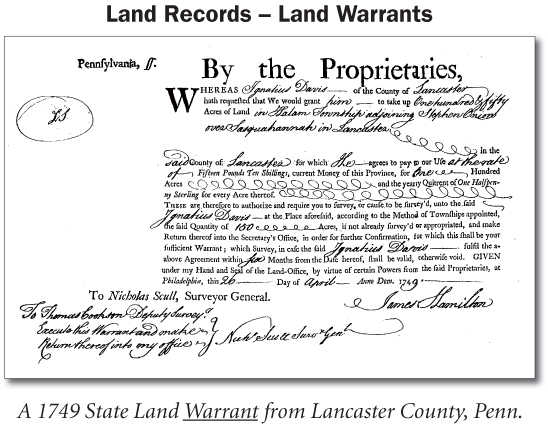 If your ancestor wasn’t the first one to acquire a particular tract of land from the government, then his land transactions will be found in county deeds. Whenever land was bought, sold, transferred or inherited, a deed was required. For information on how to find an ancestor’s deed, see the step-by-step details below. Various royal, colonial, state, and federal governments established the first claims to land in what is now the United States. These governments have since sold or given much of this land to individuals. The person who obtains title to land from the government receives a land grant or patent—which is the final step in a process that often generated numerous documents. Following is an overview of the documents that may have been created. Not all the documents may have been necessary, depending on local laws and customs. Document #1 – The Application. The process generally began when a person seeking a grant submitted an application (petition or memorial) to the king or a governor, proprietor, or government office. He may have applied to purchase land or to receive it free as payment for military or other service. Various documents might be submitted with the application, such as evidence of citizenship, military service, or a prior claim to the land. Document #2 – The Warrant. If the application was approved, a warrant was issued to the individual. The warrant was a certificate that authorized him to receive a certain amount of land. This was given to the appropriate official or land office to request that a survey (a written legal description of the land’s location) be produced. Document #3 – The Survey. Early surveys used a metes-and-bounds system (see page 22). After 1787 many lands were described by a rectangular survey system (see page 23). If the land had already been surveyed, he might have simply selected an available lot or bid for it at a public auction. A government official or land office then recorded the individual’s name and the location of the land in tract books and on plat maps showing the lots within the tract. 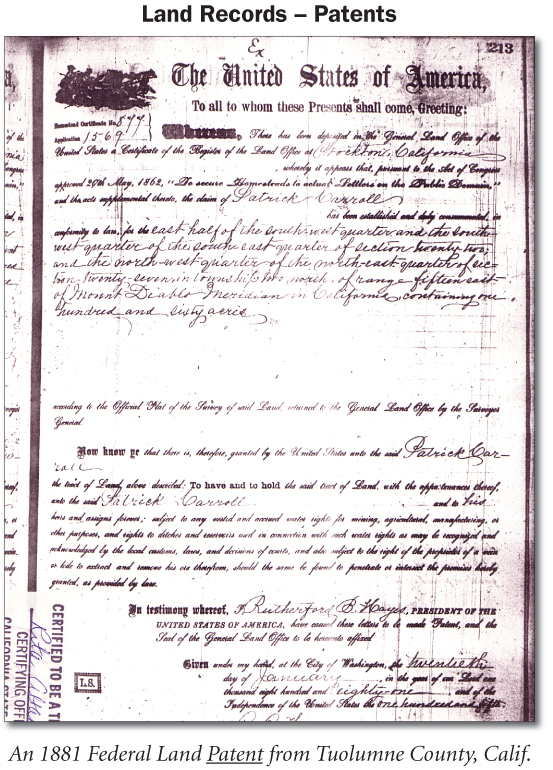 Document #4 – The Land Grant or Patent. The individual may have needed to complete certain other requirements, such as installment payments or a period of residency on the land, before he could actually obtain title to the land. Records of his completion of these requirements may have been kept in a case file along with his application. After all the requirements were completed, a patent or final certificate was issued to the individual. The patent (a first-title deed) secured his title to the land. He could then live on the land, or sell or give the patent to someone else. Land was reserved for military veterans of wars or their dependents from colonial times to 1863; first offered as an incentive to enlist, and later as a reward for service. The Land Grant Case Files (with their associated documents) are the most helpful records for family history research. Each one’s an adventure: you never know how much—or how little—it might contain. • Any additional information you have about the land, i.e., Document Number, Document Type, etc. Send the completed Form 84 (requesting ALL pages in the file) to: National Archives and Records Administration, Attn: NWCTB, 700 Pennsylvania Avenue, NW, Washington, D.C. 20408-0001. Turnaround time is about eight weeks. Find them in county deed books. 1) Family History Library — has copies of some of these land records. Check the FHL Catalog for the State, then look under Land and Property. 2) States — the original documents are usually at the state archives. Check FamilySearch for a State Resource Guide for the state you’re interested in to find contact information for the state agency. To locate the earliest land records from the agency that sold the land, you first need to know if the land grant was located in a State Land State or a Public Land State. Thus, Virginia, as a State Land State, sold land directly to private individuals. But land in Michigan, a Public Land State, was sold to individuals by the U.S. Federal Government. Kansas, Louisiana, Michigan, Minnesota, Mississippi, Missouri, Montana, Nebraska, Nevada, New Mexico, North Dakota, Ohio, Oklahoma, Oregon, South Dakota, Utah, Washington, Wisconsin and Wyoming. After a patent had been issued to a landowner, he had the right to sell the land to anyone else by using a deed. These deeded land sales are all recorded at the county level—except for Connecticut, Rhode Island, and Vermont, where the deeds are recorded at the town level, and Alaska, where they’re recorded at the Judicial District level. Deed… the private document which records that the ownership of a parcel of land was transferred from one party to another. 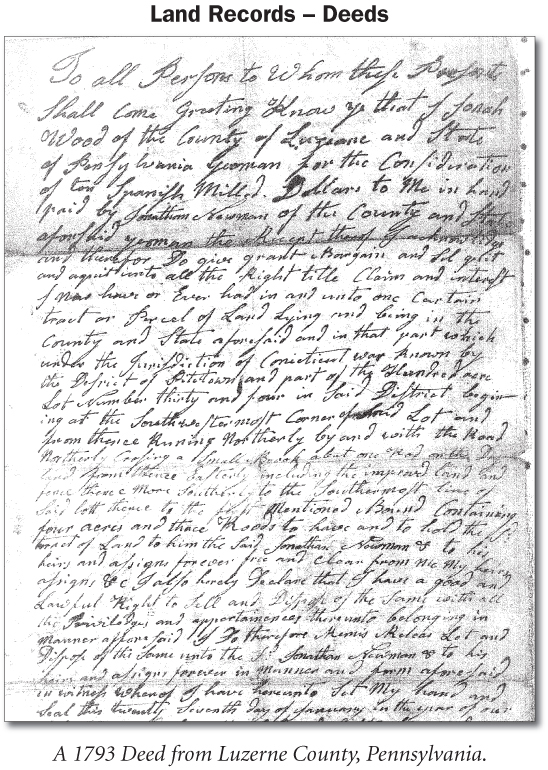 A copy of a deed is recorded in the county or town where the land is located, even though the sale of the land may have taken place somewhere else. There are several types of deeds which may be used to transfer property. Grantor/Grantee Index… the index to the county’s deed books. In some counties it may be called the Direct (Grantor) Index and the Indirect (Grantee) Index. Or, it may be called the Index to Real Estate Conveyances. It’s an alphabetical list of all the sellers of land, and all the buyers. 1) Use microfilm from the Family History Library. Check the FHL Catalog for the County, then look under Land and Property to see if the records are available. The library has deed records for over 1,500 counties in the U.S.
2) Use the mail. A county’s registrar of deed records may look in the deed index for you if your request is specific. Ask for a check of the Grantor/Grantee Index for evidence of your ancestor’s name during a period of about twenty years, and enclose a self-addressed stamped envelope. The index will list the book and page number for each deed—which you’ll need to write again and ask for copies of the deeds themselves, enclosing the appropriate fees. 3) Visit the courthouse. Ideally, you would visit the county courthouse and read the deed books yourself—but usually this isn’t practical. However, you might try contacting a local genealogical society to see if there’s a person who can visit the courthouse and do some research in your behalf for a small fee or donation to the society. Step 1 – Start with the Grantee/Grantor index. Write down the name, date, deed book and page number for every deed indexed for your ancestor—and watch for spelling variations. TIP: Make a list of the names you’re researching and change the vowels until you have a list of all possible combinations, then check the indexes for every conceivable spelling. TIP: If you’re looking for a Jonathan Newman and know he had a brother Nehemiah Newman, it may be important to look for all siblings’ deeds as well. Step 2 – Read each deed carefully. Each deed can provide clues that lead you to other research. Deeds of Trust lead to court records for loans or securities. Division of land leads to search for wills, probate records or court records for the deceased owner. Neighbors help you find family and spouses. If the deed says the land was paid for with a warrant, it leads to land grant case files or military records. Very seldom does a deed leave you with no information on where to go next. You may want to plot the exact property location on a map. Why? Because once you know the exact location of your ancestor’s land on a map, you can ask some important questions, such as: where is the nearest cemetery? Where is the nearest church? Where is the nearest town? How does one travel from this point to another point? and so on….all things that can lead you to other records. Index of Map Coverage for the state—this lists all the 7.5 series topo maps for the state, with ordering information. Maps Can Help You Trace Your Family Tree. Then use the topo map to plot exactly where your ancestor lived. You can even visit the homestead now! TIP: Boundaries Change. Remember that county and state boundary lines changed. Your ancestor might be found on the census as living in one county, but his deed might have been recorded in a different county—because when he recorded the deed to his property, the property was located in a county that later got split into different counties. TIP: “Original Entries.” Since the land patent was not a document issued at the county level, it may not be obvious from local records that a man had an original entry of land. The patent did not have to be recorded at the county unless the property was sold. But in many counties, you may find a record book called “Original Entries of Land” which gives the names and property description for those persons who obtained original patents for land in a particular county. TIP: Other Lists. There may also be Voter’s Lists, Tax Lists, or County Assessor’s records which confirm that a person was a patent holder based on a county tax liability against his property. You may also find a county-wide “Plat Book” which shows the same information. TIP: Alphabetical…Sort Of. The clerk added names to the index as each deed was recorded. Therefore, the names within each alphabetical group are not alphabetical. You need to search ALL the N’s or ALL the M’s, etc. TIP: Handwriting Cheat Sheet. Since the handwriting of many of the county clerks is more than terrible, make yourself a “cheat sheet.” Copy or trace words or letters that you KNOW the meaning of. For example you can use the name of the state (or county) to determine how the clerk forms the letters found within the name. This will help you to decipher words in the deed that contain those letters. TIP: Make A Copy. Since most old deeds are hard to read they must be studied and restudied. You can’t glean every piece of information by a casual reading of the deed on the microfilm machine. After locating the book and page # of a deed in the Index, make a copy of the actual deed. You’ll find yourself reading and re-reading these old deeds as you discover more information about your family. TIP: Watch For Neighbors. Collect copies of the deeds for neighbors so that you can study them at your leisure. Neighbors were often family or friends who moved together. And spouses were chosen from neighbors or members of the church or town. You need to compile names of neighbors to help locate your ancestors in a time and place or to find the elusive name of a female ancestor. TIP: Tax Lists. For many years there was no Federal Income Tax [hallelujah! ], rather people were taxed on land, property, slaves, etc. Land Tax Lists should always be searched. If a man was taxed for land, you know he owned land. If you cannot locate a Deed and yet the man is being taxed, it’s necessary to start over and look again for a Deed. Check the surrounding counties if necessary. TIP: Owners Before & After. Once you have located deeds and deciphered the handwriting of the county clerk to determine the legal description, check the deed description in the Tract Book, if one is available. Gather the information of the owners before and after your ancestor. These deeds may contain information on inheritance, may name family members, show a division of land between heirs or if the land is sold at a minimal price it may be a giving of land to a child at their marriage. In State Land States it is harder to track the “chain” of ownership, but remember that land and title insurance attorneys must show clear title to a piece of land for the closings that happen everyday. They have no time to spend researching each deed back to “first title” every time a piece of land is resold. Usually each courthouse has some type of record showing the chain of ownership. Ask the courthouse employees what type of record this is and where it is located. Go as far back as possible—you have no way of knowing who may be related to whom. TIP: A Woman’s Dower Rights. The dower right of any validly married woman was established as soon as her husband possessed real property that could be inherited by his children. A married woman owned an immediate and conveyable interest in one-third of all her husband’s lands during his lifetime, but no title to any portion of them. However, he could not legally dispose of the land without her consent, and if he did so, she could bring suit to recover the value of her one-third interest from the person who had received title to the land from her husband. It was required in many colonies and states that she be interviewed privately and sign a statement relinquishing her dower interest in any parcels he sold in order to convey a clear title to the buyer.